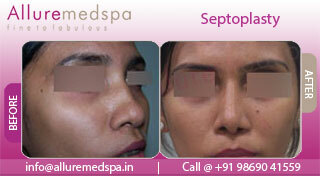 The be-all and end-all of any face enhancing procedure is to achieve the most aesthetic facial harmony. 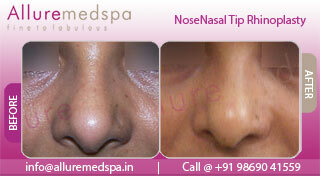 The nose, undoubtedly is one of the most distinguishing of facial features. No wonder, it must always be addressed with utmost balance and proportion in mind. 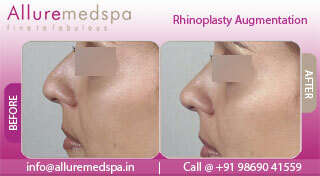 A Rhinoplasty is aesthetic plastic surgery of the nose that can address all facets of nasal form and function. The changes with Rhinoplasty can range from subtle refinements to more dramatic, stunning enhancements, depending upon your unique goals. One of the most popular procedures today, Primary Rhinoplasty refers to a first-time nose job, as opposed to a secondary or revision procedure. It’s performed to reshape and resize the nasal structure, so it fits in with your other features and achieves a more attractive facial appearance. 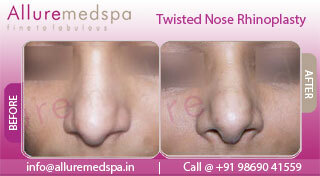 Primary rhinoplasty, known more casually as a nose job, is done with the sole purpose of cosmetic improvement. It is known to have made a wonderful difference to self-esteem of countless patients across the globe. Rhinoplasty procedures require roughly 1-3 hours and are performed under general anesthesia. During the rhinoplasty procedure, the doctor will make incisions along your nose, accessing the tissue and bones of the nasal structure. The two most common incision techniques are open and close. There are also multiple methods for augmenting your nose or smoothing surface deformities. To reduce or increase the size of your nose, bone or bone which is combined with cartilage may be excised or added to your nose. This procedure adjusts your interior nasal support structures, allowing the tip of your nose to be modified by uplifting, lengthening, shortening or thinning your nose. Autologous cartilage grafts may be taken from your nasal septum located in the interior wall of your nose dividing one air passage from the other. This option creates the best opportunity for a natural-appearing result. Skin and other soft tissues will remodel the shape of your nose, assuming the shape of the modified underlying structure. The doctor will place the skin back over the nose. A splint is then placed over the nose to support it as it heals into its new form. Nasal packing may also be used to temporarily support the nose’s new structure further. In an open rhinoplasty procedure, a small external incision is made on the underside of the nose between nostril collumela. Additional incisions are made on the inside of the nose that cannot be seen. An open rhinoplasty fully opens the nose, providing improved visualization of the nasal structures and a more direct route for surgical manipulation. The small cut left at the nose base is barely visible after the healing process. 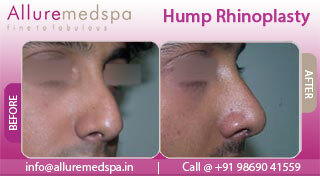 Rhinoplasty is the most complicated plastic & cosmetic surgery procedure to perform and master. Dr. Milan Doshi at Allure MedSpa, brings tremendous experience, surgical dexterity and cutting-edge rhinoplasty technology and natural artistry to achieve the most exquisite and satisfactory Rhinoplasty results. The icing is that all this comes at an absolutely “value for money’ cost with utmost hygiene factors that are of paramount importance for Rhinoplasty as for any surgery. Since confidentiality and utmost privacy of our clients are our prime ethics, Allure MedSpa is the most favored choice of many a celebrities for their corrective and cosmetic procedures. In many ways general anesthesia creates the most controlled situation possible during your rhinoplasty surgery, can also go for local anesthesia. advance technology, experienced anesthetist to monitor your progress. You will go home with a friend or relative when you are fully awake and comfortable, generally one to two hours after the completion of surgery. Cold compresses are used to minimize bruising and swelling around the eyes. The primary swelling resolves in about one week, and most go back to work school around this time. When more structural sculpting is required, eight days is common. With tip refinements only (without osteotomies), return may be as early as five days after rhinoplasty. Once you arrive back home after your rhinoplasty surgery you should expect to feel tired for a 2-3 days. Most people don't experience any pain, but rather describe more of an aching, like common cold, sensation after surgery. This is often well controlled with medication. I am not happy with the structure of my nose. I do not have a beautiful nose and I want to change it. I have no idea what to do. I have a distorted facial harmony because of my nose and people tease me because of it. I was advised by my friend to undergo Primary Rhinoplasty procedure. A friend of mine suggested me to consult Dr. Milan Doshi and visit his clinic Allure Medspa. Before making the tickets, I wanted to have a small chat with him. I got the number from the website and made a call to him. I must say after talking to him I got a little confident. He encouraged me a lot and asked me to believe him. I was assured that my surgery will not go wrong. I made my tickets and landed in India. Dr. Doshi undertook the surgery after infusing anesthesia. It was an hour of surgery. After the surgery was done, I could feel that my not so perfect has become better now. I could not have been much happier. I no longer feel embarrassed now. In fact people have started praising my nose now. I have gained my self confidence back. Thanks to Dr. Milan Doshi and his team. You may benefit from rhinoplasty if you are over the age of sixteen, the cartilage in your nose has stopped growing, and you are in good health. Rhinoplasty candidates must have realistic expectations for the outcome of their surgery and understand the capabilities and limitations of the procedure. To ensure a safe surgical procedure, a thorough medical history is taken to make sure that you don't have any medical conditions that may pose a problem to during your rhinoplasty procedure. Avoid alcohol in excess for two weeks before your Rhinoplasty procedure and one week after the surgery. The external nasal dressing and any external sutures are removed 5 days after surgery. The internal nasal sutures are dissolve-able and will come out on their own. If an Open Rhinoplasty approach was used, you may experience temporary nasal tip numbness improve in 8 weeks. This resolves as the nerve endings regrow into the nasal tip skin. What is Primary Rhinoplasty Surgery? 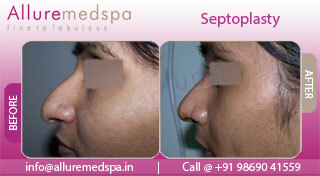 People who are not satisfied with their nose can undergo the procedure to change the structure. Who are the candidates for Primary Rhinoplasty? 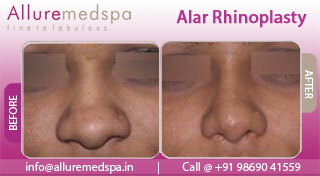 The procedure is undertaken by those who are not satisfied with their nasal structure and want to change it. How is the Primary Rhinoplasty performed? The surgery is little complicated and your surgeon will have a full discussion with you before conducting the surgery. In the process of the surgery, anesthesia will be infused by the surgeon. Once you fall asleep, the surgeon will provide with nasal splint to provide strong support to the nose. The surgeon sometimes uses grafting method to change the structure of the nose. Are there any side effects for Primary Rhinoplasty? The primary Rhinoplasty will not give you a new nose. In fact it will change the structure of the nose. You should not have over expectations from the surgery. The surgery will help to correct the deformities. However, you should not keep unrealistic expectations. The procedure will correct the nose deformities, not create a new nose. One should have to be really careful after the surgery and follow doctor’s instructions. Will I have to take any precautions after the surgery? It is very important to take certain precautions. The surgeon will provide you with certain medications in case there is any swelling and pain. You should always avoid vigorously washing your face and blowing your nose. This will add to the problem. The surgeon will be there to provide you advices. A patient will take 7 to 10 days to fully recover after the surgery. However, it varies from person to person. Your surgeon wills advice you about the time you can return to your work. After 2-3 days of complete rest you can start your work. However, it will take couple of months for the wounds to completely heal. What is the cost of Primary Rhinoplasty Surgery?